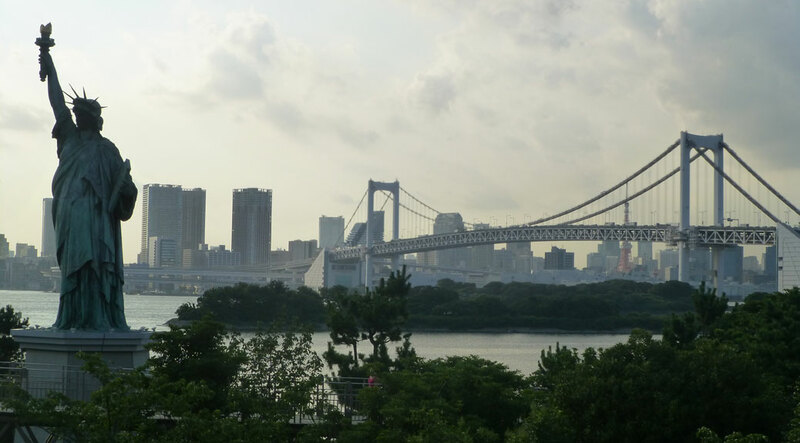 Odaiba is an artificial island built in the 1850s to protect Tokyo from the U.S. Navy and Commodore Matthew Perry’s Pacific fleet. In the 1990s, it was redeveloped as a “city of the future.” That plan never fully materialized before developers starting building shopping malls and hotels. As a result, there’s an interesting mix of architecture on the island, but mostly just a lot of commerce. The commercial part of the island is easily walkable and we had a few sights in mind. Along the way, we found a lot of unexpected sights as well. Several tents were set up in the area between DiverCity shopping mall and the West Promenade park. Completely random things were everywhere, like this superhero cutout over a tent with a Viking toddler riding a large, white octopus. 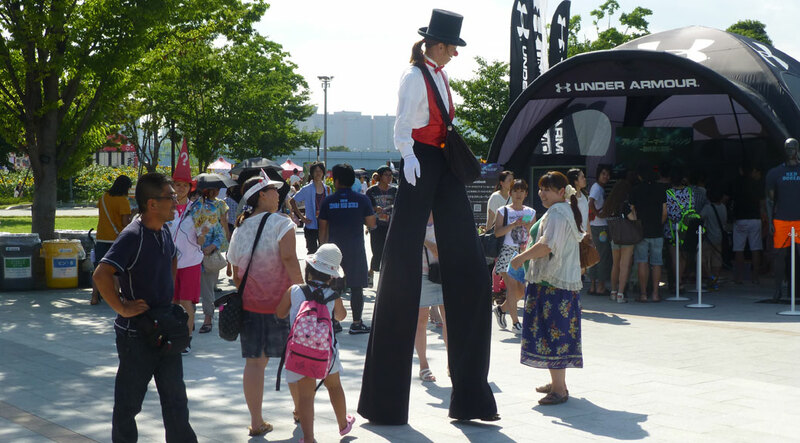 Or the man on stilts high-fiving everyone who walked by as he passed a tent selling Under Armour sports gear. I wonder if he can find workout pants that fit? 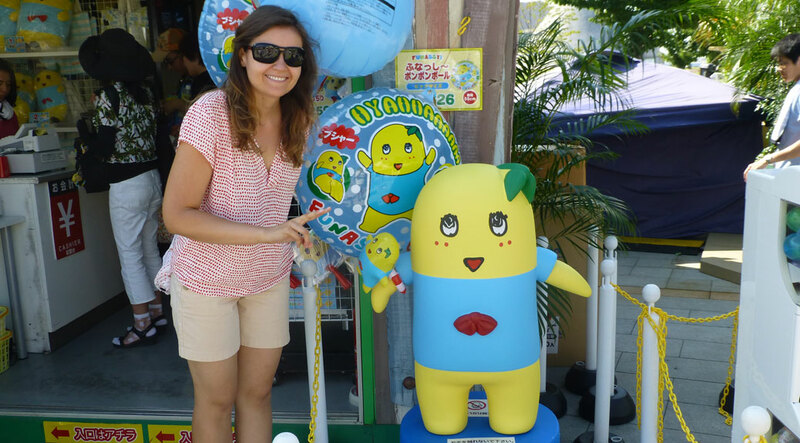 I actually found comfort in seeing some normal Japanese weirdness, such as the Funassyi shop. Everyone loves Funassyi! In case you’re wondering, Funassyi is a pear. Funassyi’s parents were pears and Funassyi is the fourth of 274 children. We must refer to Funassyi by name because Funassyi is neither male or female and, therefore, is immune to pronouns. 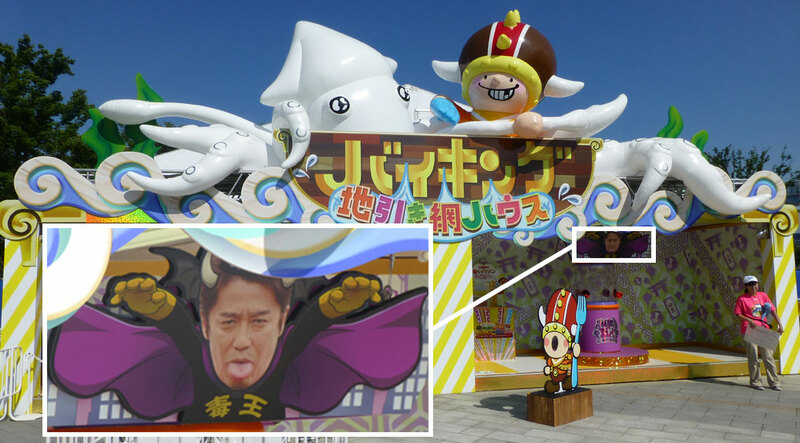 And this is what I consider normal on this day in Odaiba. Funassyi is a pear, in case you’re wondering. We looped back around to our first planned destination. 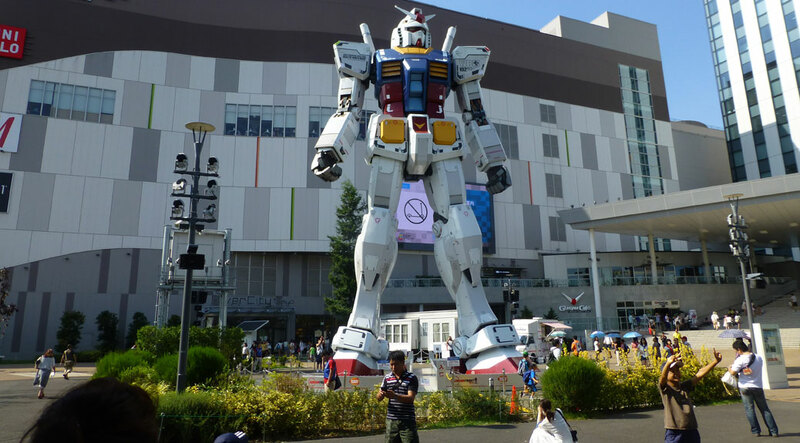 A 60-foot tall Gundam robot statue looms in front of the DiverCity Tokyo Plaza shopping center. Technically, this is a suit worn by Amuro Ray on the anime series Mobile Suit Gundam, one of the most popular anime series to make its way past the shores of Japan. Don’t even THINK about shoplifting from DiverCity! A short walk from DiverCity is Toyota’s MegaWeb complex. The first building is part of the Venus Fort mall, which is modeled after Venice, Italy and is a pretty blatant rip-off of the Forum Shops at Caesars Palace in Las Vegas. The museum itself featured several restored cars, both made in Japan as well as cars imported into Japan. The displays were broken into pre- and post-World War II sections, showing the foreign influence on the country in the years following 1945. 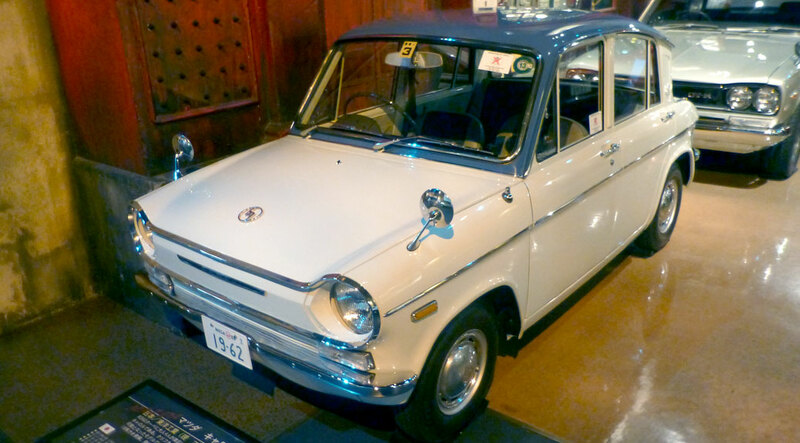 The Western influence on post-war Japan showed in cars like the 1962 Mazda Carol and imports from automakers including Ford, Chevrolet and Fiat. Pre-war cars included a 1937 Datsun Model 16 sedan and an American-imported 1936 Cord 810. All of the vehicles have been painstakingly restored to original condition by Toyota’s restoration experts. It’s a nice tribute to Japan’s long automotive history while weaving in the story of the country’s evolution during the 20th century. 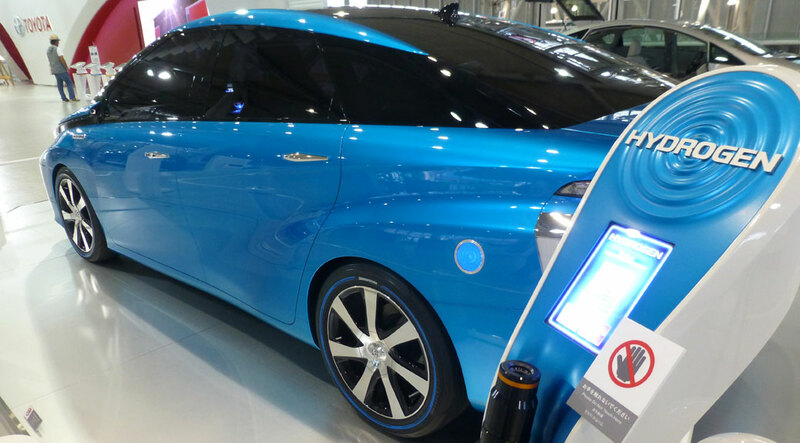 Perhaps even more impressive was the MegaWeb’s Toyota City Showcase, which featured several of Toyota’s concept cars. As tree-hugging Cascadians, we left our Toyota Prius in good hands back in the states, but we were drooling over potential future purchases as we walked through the showroom. The revamped hybrids with futuristic dashboards and single-seat three-wheel cars were great, but we were super-impressed by the FCV hydrogen fuel cell car, scheduled for a 2015 release. It’s an attractive car powered by renewable energy and only emits water vapor as byproduct. Sign me up! 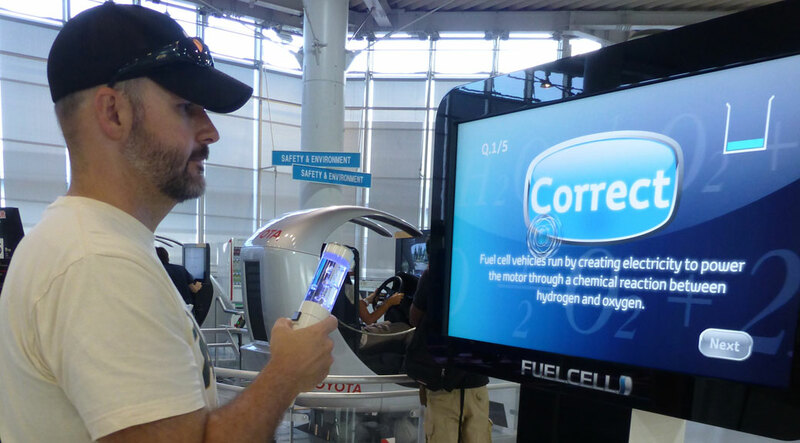 Playing the Hydrogen Trivia game at Toyota MegaWeb. The game wand is a replica hydrogen fuel pump. So, we’ve seen the future of automobiles. What’s next? How about swinging by the Statue of Liberty. Yes, that’s right… Odaiba has one of those too. Apparently, the French version of the Statue of Liberty was in Odaiba for “The French Year in Japan” back in the late 1990s. It was so popular, a permanent version was built in 2000. Hundreds of these things have been erected around the world, including three more in Japan. The statue in Miyagi Prefecture was damaged by the 2011 tsunami. Since we’d clearly jumped the shark in Odaiba with the whole Statue of Liberty thing, we headed back to the mainland for dinner and our final stop of the day. Despite decades of wreaking havoc on their beloved country, Japanese people still love the monster known as Gojira! In celebration/marketing of the newest Godzilla movie, which opened in Japan over the weekend, a replica of the monster has been built in the Tokyo Midtown Gardens park. A tame light and smoke show runs every evening while the exhibit is open. 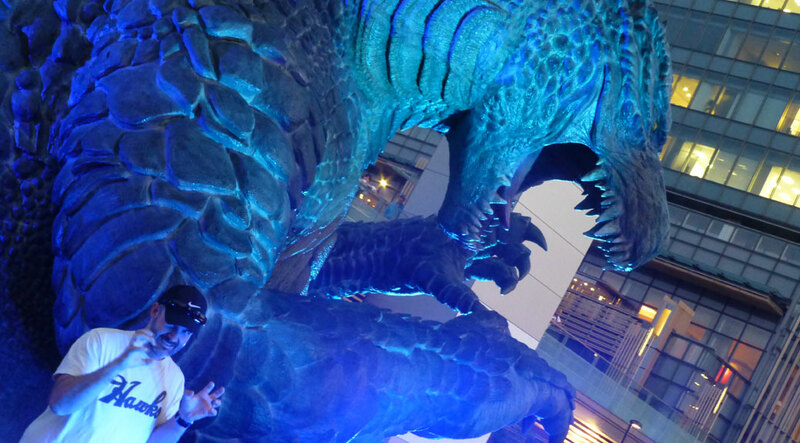 Kids screamed playfully, more interested in running under Godzilla’s wavy tail than away from his sharp teeth. This, I believe, is the beauty of Japan. Tokyo is an amazing city and from one train station to the next, you can enter a completely different world than the last. This was a playful day and tomorrow might be a nature day or a traditional day. Tokyo offers all of that and more. I ran across this a while back and have been trying to figure a good time to share it…I thought of you guys immediately!